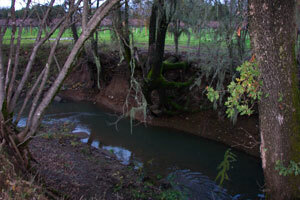 This site encompasses 90 acres of floodplain lands adjacent to Wine Creek and Dry Creek. Vineyards are managed by winemaker Steven Canter using organic and biodynamic methods. This stretch of Wine Creek supports Coho salmon but due to channel entrenchment moving upstream from Dry Creek, the creek is also significantly degraded with eroding stream banks and undercut and dying riparian forest. 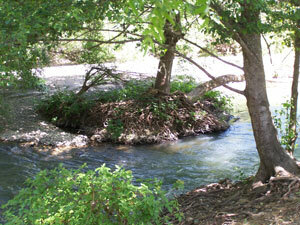 This site encompasses 90 acres of floodplain lands adjacent to Wine Creek and Dry Creek. This stretch of Wine Creek supports Coho salmon but due to channel entrenchment moving upstream from Dry Creek, the creek is also significantly degraded with eroding stream banks and undercut and dying riparian forest.